At the time that Google snapped up the ITA travel software company, one of the biggest claims they made to justify the acquisition was that it would lead to innovation in the field of travel research. Travellers might therefore have good reason to be disappointed with Google’s ‘innovations’ thus far – except for the introduction of flight times and routes, little had changed. Now however, it looks like we may finally be seeing some of this much-heralded innovation, with a new experiment by Google that allows users to “search hotels by travel time”. With the ability to filter hotels by travel time, Google Maps has set itself apart from the competition (until they all catch on at any rate). 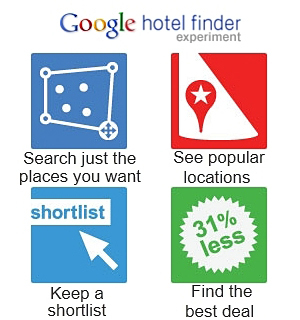 All the top travel search engines these days have maps and allow certain filters to be used, such as cost, distance from the city center and so on, but by offering users the chance to search for hotels according to travel time from any given point in the city, Google have really hit upon something quite unique. Before we go getting to excited, we ought to remind ourselves that the ‘travel time’ feature is only available in a few select cities for now – those in which Google has partnered with local agencies to integrate public transportation data into Google Maps – but even so, for the cities it is available in, the feature seems quite practical. As well as travel time, the existing search parameters of all hotels in a given area and hotels in popular areas remain the same.